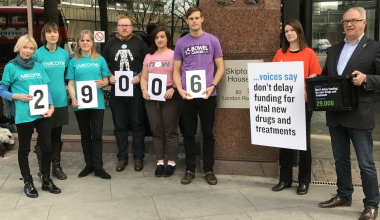 Today (Thursday 30 March) we join Prostate Cancer UK and a coalition of health charities to hand in a petition, signed by nearly 30,000 people, calling on the National Institute for Health and Care Excellence (NICE) and NHS England to scrap plans that would delay access to lifesaving new drugs. This is ahead of an NHS England board meeting today at which the final approval for the proposals is set to be made. The plans propose that any new treatment approved for use on the NHS by NICE, which is likely to cost more than £20million per year in the first three years, could be subject to indefinite delays and access to it restricted. This is while the NHS negotiates with the manufacturer on the price. These changes could affect hundreds of thousands of vulnerable patients. Estimates suggest that one in every five new treatments is likely to be affected. The proposals are likely to have a greater impact on treatments for more common conditions. This is because the more people that meet the criteria for a treatment, the easier it could be to breach the cost threshold. Bowel cancer currently affects over 41,000 people each year.